Dominant 7th chords are by far the most common form of 7th chord. In fact, they are so common that, while other 7th chords are written out by several letter and number combinations (such as EM7, Fo7, Db+7, etc. 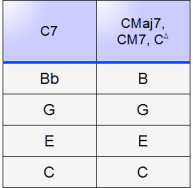 ), the Dominant 7th is indicated by just a "7" after the chord name (A7, Gb7, B7, etc.). There are several reasons as to why it is called a "Dominant" 7th. The easiest to explain is that, when played, it dominates the music in such a way as to make the music resolve to a chord a fifth lower than the Dominant 7th (G Dominant 7th leads to a C). Much like altering simple chords, the Dominant 7th chord can be formed by altering the Major 7th. Instead of using a Major Triad/Major Interval combination, we will use a Major Triad/Minor Interval combination. The phrase "Major Triad/Minor Interval" may seem odd to you. Don't worry, you're not alone. You won't hear musicians talking about chords like that. Here, though, the phrase is a shorthand way to say, "A 4-note chord built from a Major Triad with an added note the interval of a Minor 7th above the root." In lieu of such a wordy description, I opted to use the term "Major Triad/Minor Interval" when discussing the construction of this particular chord. Elsewhere, we will simply use it's functional name, "Dominant 7th". As an example, let's form an Eb Dominant 7th chord. A Dominant 7th chord is made up of a Major triad, and a Minor 7th interval. The name of the chord gives us the root, that is, Eb. We know that an Eb Major triad is made up of Eb, G, and Bb. The Minor 7th Interval above Eb is Db. Therefore, the notes Eb, G, Bb, and Db make up the Eb Dominant 7th chord. Let us follow the same procedure again to form a D Dominant 7th chord. We know that a D Major triad is made up of D, F#, and A. Therefore, the notes D, F#, A, and C make up the D Dominant 7th chord. We will now add to our chart the Major/Minor construction of the Dominant 7th Chord. As you can see, the only difference between the Major 7th and the Dominant 7th is the 7th itself (yes, that is a mouthful!). Since both chords are based on the Major triad, the chart attempts to reflect this similarity by sharing the "Major Triad" box. This will be a helpful feature of the chart, once it is filled in with all six forms of the 7th chord!